Srey Roth at the Mat Warehouse where she works. 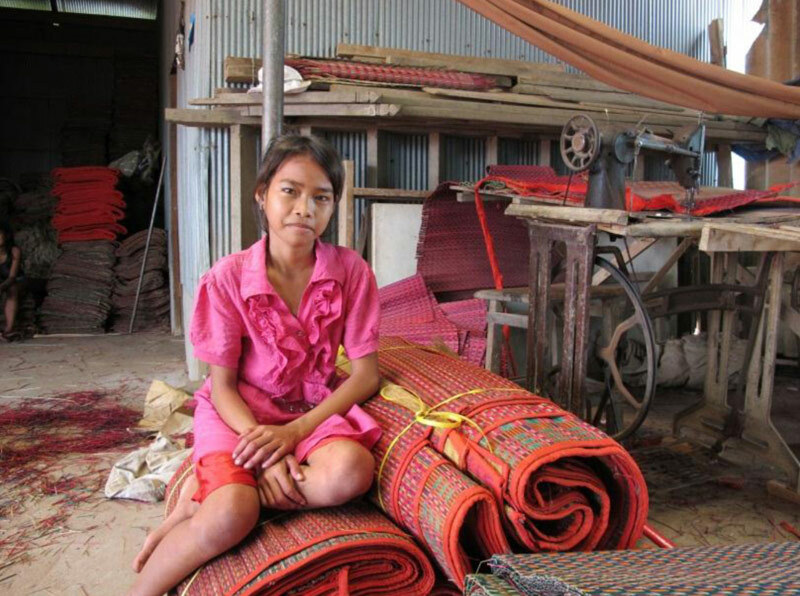 Reurn Srey Roth attends primary school in Kandal province but works part-time at a local mat warehouse. Srey Roth wants to be a teacher and a doctor when she grows up. “My name is Reurn Srey Roth and I’m 13 years-old. I live in a small house in Anlong village in Khsach district in Kandal province. My house is small. The roof is zinc and the house has wooden walls. It has one big room with a small separate kitchen. I live with my parents and I often visit my aunt’s house. I also visit my grandfather’s house often too, which is near. My father works at the brick factory about two kilometres away and my mother stays at home, she doesn’t work. I have five siblings. My oldest sister is 18 years-old and she is in Grade 11. My oldest brother is 16 years-old and he’s just finished Grade 8. And he’s now a monk living at the pagoda nearby. My younger sister is 11 years-old and she is in Grade 5 and the other sister is seven years-old and is in Grade 1. I have another brother who is nine-years-old and he’s in Grade 3. I go to Prek Tamak Primary School and I’m in Grade 6 but I had to repeat one year because three years ago I had an accident on my bicycle. A motorbike hit me and broke my leg. My sister was with me at the time and she has a huge scar on her leg. Before my leg used to hurt but it doesn’t hurt anymore. I used to use a walking stick but not anymore. The doctors at the hospital put in some steel rods. I was at the children’s hospital for nearly three weeks with my sister. Four months later the doctors removed the steel rods. I like school because I like to learn. I like to complete my classroom exercises at break time and I like playing with my friends. My favourite subject is maths at school. I like to work with numbers. I don’t like to play games with the boys. I have five to six best friends, but Sophy is my best friend because we do classwork together and we play together at school. Before school I wash the dishes, clean the house and sweep the floor. After school I come home and sometimes I cook rice for the family for lunch, when my mother is working in the rice fields. I then go to work at the mat warehouse around 1p.m. and work until 5p.m. I earn between 2,000 – 3,000 riel (US$ 0.50 – 0.75) per day. I give most of the money to my mother and keep 500 riel (US$0.12) for myself – it’s my pocket money. With the 500 riel, I buy water, sweets and a juice drink. I’ve been working at the mat warehouse for two to three years. At work I sew the mats and cut the seams to make it tidy and ready for sale. My favourite thing is my school bag because my mother bought it for me. During my free time, I go to work at the mat warehouse. When they don’t need me, I stay at home, read my school books and do my homework. I like playing with my skipping rope and playing lout meak (hopscotch). I feel happy when I complete my homework and do it correctly. I’m sad when I do my homework wrong because my friends laugh at me.